When it comes to skin care, I have not always been very diligent…especially when it comes to the sun and tanning. But lately, I have become a lot more aware of how important it is to take care of your skin – not just for it’s appearance but for your body’s overall health. This has really made me start taking my skin care regime and the products I use very seriously – one of them being sunscreen. Since I was a kid, I have always enjoyed laying out and soaking up the sun any chance I had. I still love the opportunity to get a great tan. But OF COURSE I have been told for years that tanning is bad and how important it is to load up on the sunscreen. We all heard the drill…use sunscreen or suffer the consequences!!! But…is that all really true? I may be an example of how not all sunscreen is as great as we’re led to believe. I learned at a young age that I had to stop applying sunscreen because of the constant reaction I was having from it. I actually preferred to apply nothing and risk a burn, than to suffer from itchy, rashy skin where the sunblock was applied. Obviously, this led me to continue my love of spending numerous amounts of time in the sun with little to no protection. Realizing now…that’s not the greatest solution, as the sun does have some damaging effects that we should be protected from. I started to do a bit of research and found a ton of information on the topic of natural vs chemical sunscreens. And I couldn’t believe there are actually a lot of warnings out there about the toxic ingredients. A major thing I learned is there are two ways that a sunscreen can protect the skin – with a mineral barrier or a chemical barrier. It seems crazy to me that a chemical barrier is even an option…but whats even more crazy is that its the most commonly used. INSANE!!! Apparently, most mineral sunscreens typically use ingredients like zinc oxide or titanium Dioxide. These are natural minerals that create the barrier of UV rays from the sun. Unlike a chemical alternative that would include ingredients like oxybenzone (many known negativities) and so many others that I can’t even list them all. I can’t believe that we’re applying all of these chemicals onto our skin and that they are being absorbed into the rest of our body, actually CAUSING just as much or MORE damage than the sun! Check out this great article – Is Your Sunscreen Causing Cancer? 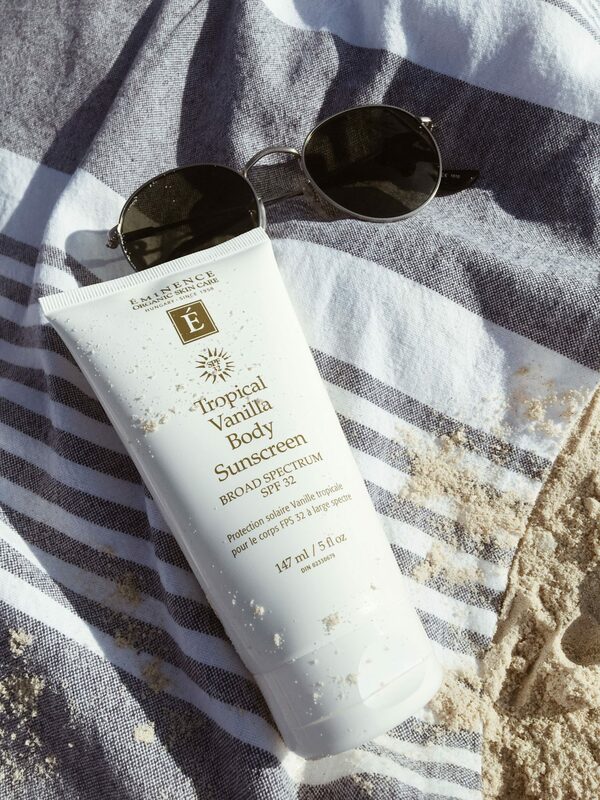 SO…after knowing all of this, I have trialled numerous natural and mineral-based sunscreens (Including DIY recipes) and have found a few that work great. But one of my recent favourites has to be from the skin care line Eminence. I am a huge fan of this company and use a wide selection of their skin-care products. So it wasn’t a huge surprise that I would also love their sunscreen as well. On my recent trip to the Philippines I got to put this one to the test. I loved that it was easy to apply, smelled great and didn’t have a super-sticky/greasy feel. I also felt great that I can apply as much as I want without worrying about the harsh ingredients. My skin felt soft, hydrated AND I still managed to get a great tan. That’s a win in my books! RELATED: Why Hawaii Wants to Ban Oxybenzone Sunscreens | Sunscreen Harming Marine Life?